Maurice Ravel, born 1875 in Cilboure is often marked as an "Impressionist" in the same breath with Claude Debussy. Apart from some rather obvious similarities, on closer examination the contrary nature of the composers and their work become obvious. From the beginning Ravel's work was characterised by experimentation and a search of new means of expression. In particular, Ravel's piano, works were successful in creating new sounds and atmospheres, which demand very high requirements on the part of the pianist. The "Sonatine" written in 1905 reveals Ravel's full mastery. It is a model of fastidious classicism that contrasts with his elaborate "Miroirs" (also from 1905). The album "Miroirs" consists of five pieces whose impressionistic character is underlined by titles and infinitely more marked than in the work of Debussy. These images are extremely diverse. 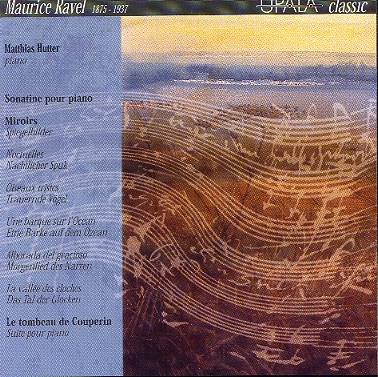 The suite "Le tombeau de Couperin" from 1917 is the last of Ravel's compositions for solo piano. He imitated the early composers, those harpsichord players and lute players who, by their own masterpieces, paid homage to the Masters who had trained them and whom they admired. Ravel has erected a monument to the memory of Couperin and to 17th century French music in general. Matthias Hutter started playing the piano at the age of six. Only six years later he wrote his first compositions, and at the age of fourteen, he won the competition "Neue Musik für Kinder und Jugendliche" with his "Fantasy for Wind Instruments". In 1988 Matthias Hutter began his studies at the Robert Schumann-Academy of Music in Düsseldorf, where his teacher was Carmen Daniela. Master classes and contacts with well-known pianists such as Pavel Gililov, Maria-Eliza Tozzi and Lazar Berman formed his artistic and pianist development. In 1997 he finished his studies with the "Konzertexamen". Matthias Hutter plays national and international concerts as soloist as well as chamber musician. Since 2000 he has been the director of the music school in Philippsburg in Germany.